Viticulture: Essential Edition is one of the most polished, professional board game packages I’ve ever seen. From the perfectly sized box to the phenomenal graphic design to the most succinct and clear rulebook I have ever read, Stonemaier games have gone above and beyond to provide a quality product. Beyond the beautiful presentation lies a fantastic worker placement game that is a lot more interesting than its closest popular peers–Stone Age and Lords of Waterdeep. 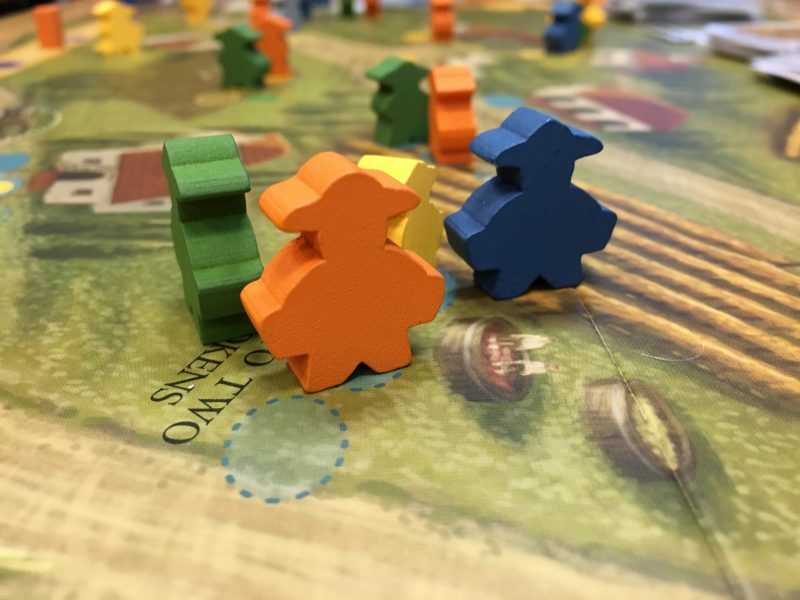 While perhaps a half-step more complicated than those two games, Viticulture has the advantage of being more thematically cohesive. Let me explain. 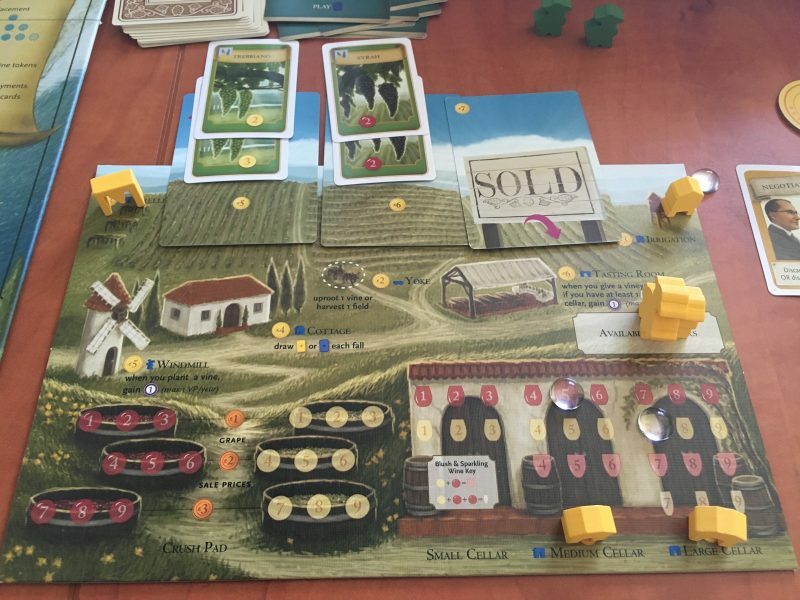 As the name implies, Viticulture is a game about winemaking. The player board contains three major sections: the fields, the crush pads, and the wine cellar. 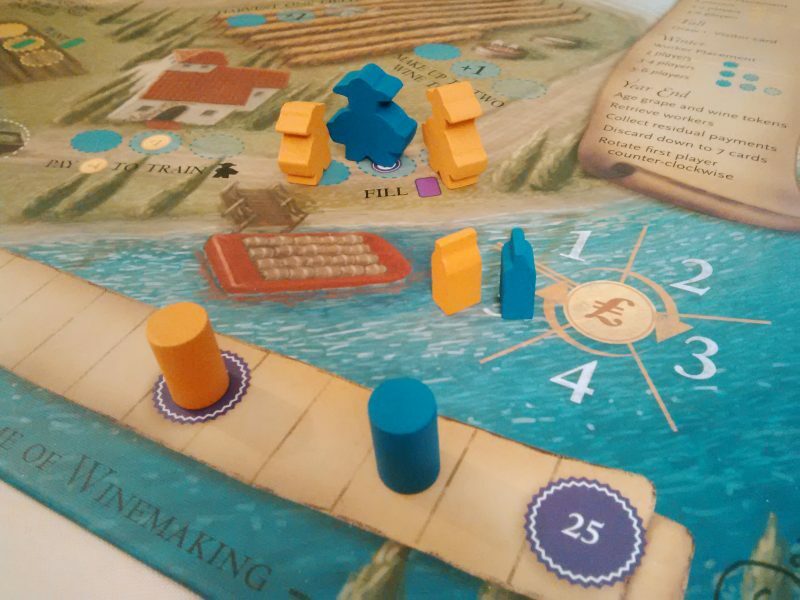 On the central board, there are a number of different actions available to the players, five of which are central to the winemaking process. First, you acquire vines for your field. These vines are represented by cards which have different grapes actually used in Tuscany (Sangiovese, Malvasia, Pinot Nero, etc). Second, you must plant those vines in your field. Third, you must harvest the grapes, which sends tokens to your crush pad. The fourth key action is making the wine itself, which transfers the tokens from the crush pad to the wine cellar. Finally, you can sell the wines you have in the cellar. Every other action space on the main board is designed to help you accomplish those five tasks. You can give tours of the winery to make money, add buildings to help your operation grow, draw additional grape or wine order cards, or play visitor cards. These action spaces are split into two “seasons”, so you have to consider how you want to split up your workers between them each round. The visitor cards, which are essentially action cards, are one of the most interesting aspects of the game. Usually with this kind of Euro-style game if there is an action card mechanism, the cards will only apply marginal or situational benefits. In Viticulture, every single action card is significant. From what I understand, part of the upgrade with the Essential Edition was a reworking of the visitor cards to make them useful in any phase of the game. Every time you draw a visitor card, it can potentially be the key you need to push toward a more aggressive strategy, or move you ahead one step further in the winemaking process this round, or give you an action that lets you sidestep an action space blocked by other players. I have never played a Euro-style game where action cards are so game-changing, and it’s a great feature. It creates a push your luck dynamic, where you can risk going for more visitor cards at the expense of other pieces of the puzzle, because there’s a decent chance that the card is going to give you an even more efficient way to accomplish the same goal. The downside, of course, is that if someone happens to get a string of visitor cards that work particularly well together, it can propel them into the lead. In one game I played, one of my opponents got 2 cards that cheaply and easily let him acquire additional workers. By the end of the very first round he had doubled his worker pool from the starting 3 to the maximum of 6. The rest of us were left behind with 3-4 workers and he managed to build up a winemaking engine significantly quicker than us. By the midway point of the game, there was no chance that anyone else was going to catch up to him. In another game, I happened to draw visitor cards that always seemed to be poorly timed. While the designers have done a fantastic job making the visitor cards as useful as possible in any situation, luck can still be a significant factor. Luck can also play a significant factor when it comes to the wine order cards. They dictate your winemaking strategy as they are the only way to get victory points through selling wines. If you happen to draw a good mix of early game and late game focused wine order cards at the beginning, you can probably go throughout the game without drawing any additional cards, saving 2-3 actions. If you do not get a good mix of cards (for instance, getting 3 orders that only want red wine), you get a difficult decision: pursue a sub-optimal strategic path dictated by your cards, or spend additional actions to try to draw better, more balanced orders. This does not seem as variable as the worker cards, but I believe it bears mentioning. Fortunately, the game provides a couple of clever ways to mitigate the common areas of bad luck in worker placement games. The most common frustration with this genre is an opponent blocking a critical action on the main board, robbing you of the final push you need to achieve victory or severely delaying your economic engine. Viticulture mitigates this frustration in three small ways. First, everyone gets one “grande” worker, which can be placed on any action space, regardless if it has already been taken. Second. the aforementioned visitor cards frequently give you alternative means of accomplishing the actions on the board. Third, the turn order is determined through a small mini-round, so if you need to go toward the front of the turn order, you frequently have that option. Grande workers are frequently seen in packs. This clever mechanism involves 7 spaces on the side of the board that determine turn order. There is a first player token that moves around the board as in most games, but that only determines who selects first on the turn order track. Every space except for the first has an associated benefit. As you go further down the track, the benefits become more and more enticing. They might simply give you a single coin, an extra visitor card, or even an additional worker for that round. The turn order track is a great addition to the game and is certainly a better solution than first player rotating around the table each round. However, in most of my games there was a very significant advantage to being able to grab the first spot in the last round. The game ends at the end of the round in which someone has hit 20 victory points, so you will know almost certainly which round is going to be the last. In that round, the “harvest grapes”, “make wine”, and “fulfil wine order” spots are going to be in incredibly high demand. If you need to do two or more of those actions and you are picking 3rd or 4th for turn order, you will probably not be able to accomplish those two actions without the aid of a visitor card. In that sense, turn order problems are mitigated but not eliminated. I think this method is probably also better than the Agriciola/Lords of Waterdeep method of having a particular action space that grants you first player, but I am not completely sold yet. You will have games where, due to the where the first player token is, you will know you have no chance of winning going into the final round. Despite my reservations above, Viticulture is an incredibly pleasant and fun game. The presentation is stellar and you can’t help but have a good time seeing your little wine production system play out. Even if it doesn’t have the strategic depth or refined balance of its more serious worker placement peers, a 4-5 player game with people who know the rules is only going to take a bit over an hour, so if you feel like you get robbed by one of the luck elements, it doesn’t feel like you’ve wasted your time. The Essential Edition version adds a pinch of flavor by including “Mamas and Papas” cards which provide variable starting resources. It also comes with a solo variant which is simple and enjoyable. Every mechanism in the game feels like it was designed and crafted with care and ingenuity. One final note of interest is that the player count can dramatically affect the feel of the game. Every action space on the board has three spaces. One space is available in 1-2 player games, two spaces are available with 3-4 players, and all three spaces are used with 5-6 player games. I’ve not yet played with 6 players, but the 2 and 4 player games feel significantly more cutthroat and tight compared to the 3 and 5 player games. I’m not sure if I count this as a positive or a negative, because while it can be annoying to have the feel of the game change so significantly by player count, it also provides two unique playing experiences. Neither of them I feel are better than the other–they’re just different. I love how the glass wine tokens magnify the image underneath. To me, this is the perfect introduction to worker placement or euro games. It has a confidence of presentation and design that makes it welcoming, and thematically sound mechanisms that just make sense, so you can teach the game with the language of the theme instead of the language of board games. The process of playing the game in and of itself feels rewarding regardless of how well you do. It’s short enough that trying out alternative strategies doesn’t feel like a waste of time, and that final round where multiple people are trying to barely edge out each other on the victory point track is exciting. Viticulture: Essential Edition is aptly named. I hesitate to call any board game essential because that seems hyperbolic–no game is going to be good for every player. But if there’s a worker placement game I’ve played that deserves to be considered for every gamer’s collection, it’s this one. I have also played the expansion, called Tuscany, and have decided to give that its own full (forthcoming) review because it changes the game so significantly. 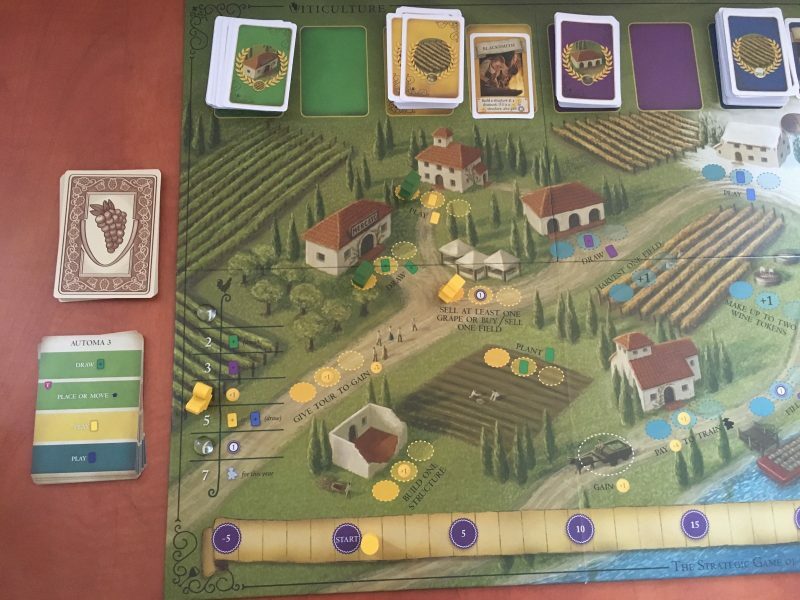 The short version: Tuscany is a great expansion that definitely addresses some of the criticisms I have with Viticulture head-on, although not without introducing some new problems. It changes Viticulture into an almost entirely different game, and I like both the base version of the game and the Tuscany version a lot. This game is definitely like a fine wine – you can be very cerebral and analytical about it, and you can just enjoy it. For all my usual competitiveness, when I play Viticulture, I just lay back and relax while I build my winery. I think it’s because I grew up in a wine-making town, so this game has a very homey feel to me. It’s hard not to feel that way when playing the game. The combination of the game design and Beth Sobel’s art is perfect. The Visit from the Rhine Valley mini expansion is a great addition to the game for me. Whereas before it was possible to win the game through the use of visitor cards to earn victory points (thematically feeling like your winery is more tourist attraction than wine producing), these cards focus on building your wine making engine only. It’s far more thematically pleasing in my opinion and ultimately more satisfying when you win.